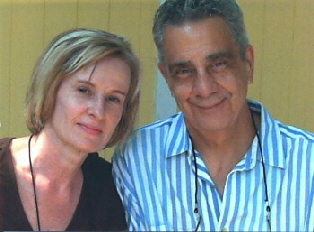 Stella and Robert have been honored to be the human companions for several dogs. Stella Mustanoja McCarty, who illustrated the books, taught painting and drawing for over 30 years at the Vantaa, Finland, Art School. She graduated as a painting major from the Art Academy of Finland and also holds degrees from the University of Helsinki in Education and Sociology and Social Policy. Robert McCarty is a producer/writer/director of films and videos on subjects ranging from teenage lifestyles to race relations. His short film, Rooftops Of New York, was nominated for an Academy Award. He is a former adjunct instructor at Teacher's College, Columbia University and at the School Of Visual Arts, New York City. Planet Of The Dogs was inspired by the many stories made up for his four children and seven grandchildren. 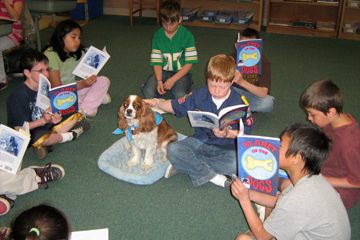 Third Graders reading a Barking Planet book in the Pages for Preston Therapy reading dog program. Copyright © 2013 Barking Planet Productions. All rights reserved.